An early made Crookes dark space tube made before 1900 with blue glass seals. 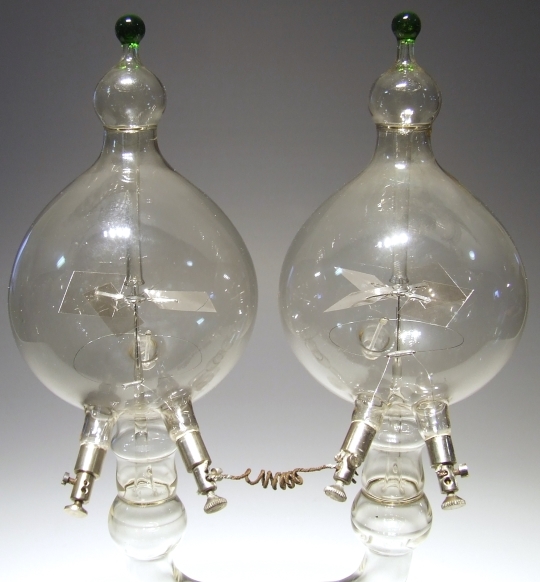 Two very early Crookes tubes. 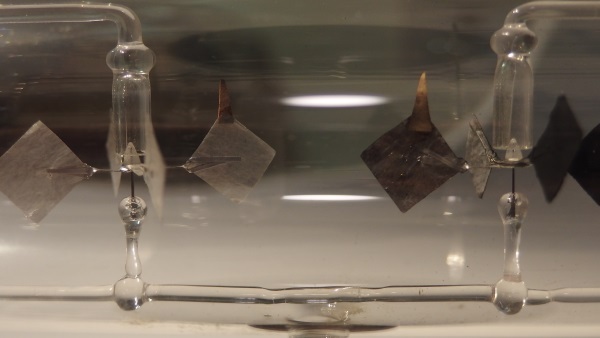 With envelope diameters of about 6 centimeters, one with metal electrodes, the other with pyramidal shaped carbon electrodes. 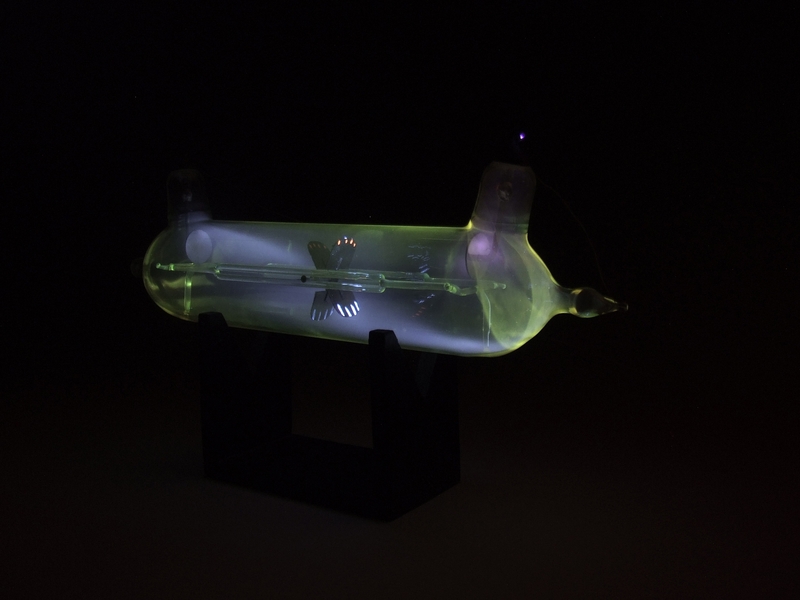 The tube with the small ball electrodes is a tube with an absolute vacuum, there is no glow or spark in the tube even with very hight tensions, that even after all those years! Darkening on the glass suggests restoring the vacuum due to heat in the past. 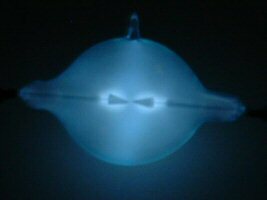 The other tube has some gas molecules which will give a discharge when activated, the odd electrodes are still a mystery. 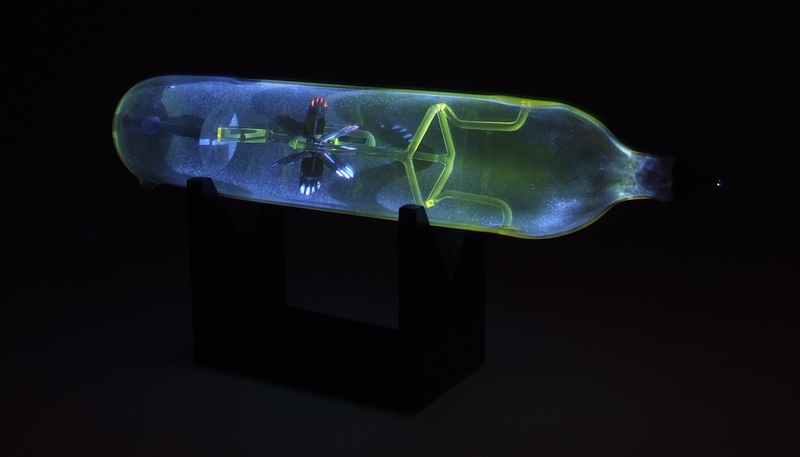 The "gassy tube" has strange electrodes. heat when they hit a platinum foil. 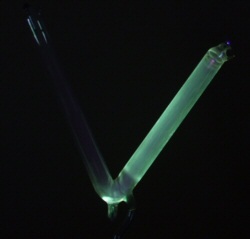 Early Crookes uranium glass discharge tube . 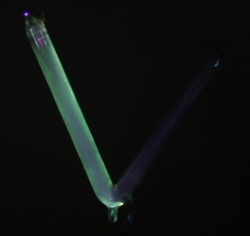 Tube under UV, in working order it must have looked like this. different colors, like: green, blue-white, blue, red and yellow. 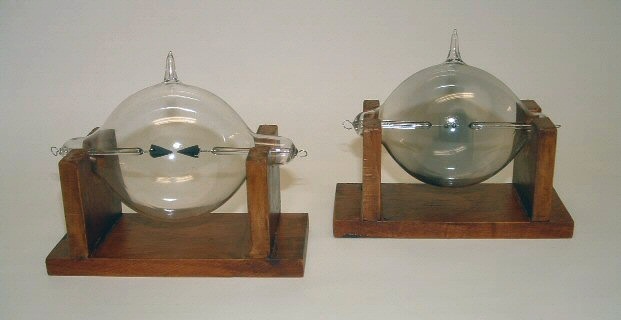 turns the peddle wheel similar as the Radiometer. necessary to move the wheel was insufficient. 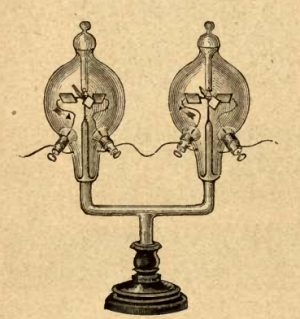 Here a drawing from the Deschanel 1869 Physics book describing the absolute vacuum tube as a perfect isolator. 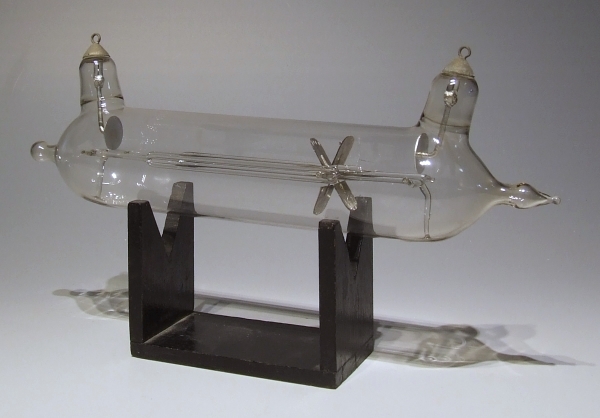 mill tube, in English sometimes paddle wheel tube. 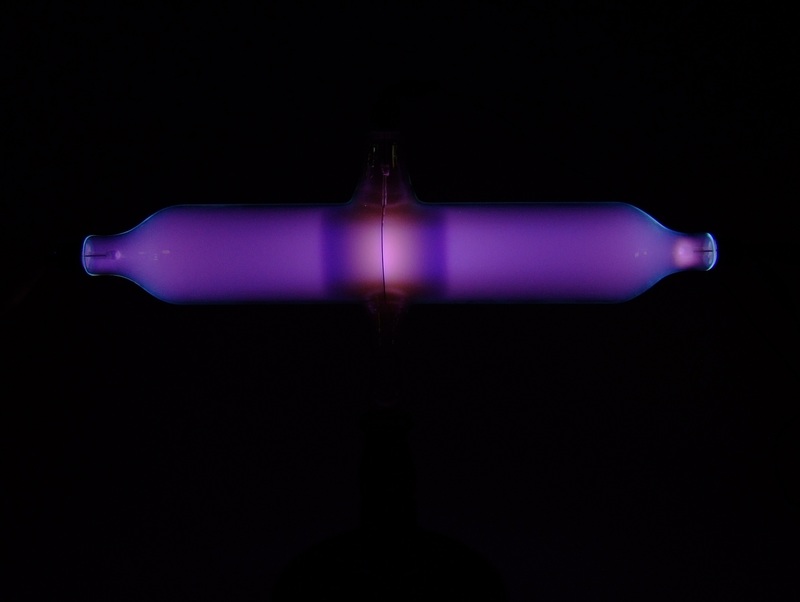 electron beam to the vanes. Radiguet in Paris as stated on the label. on Rue des Filles du Calvaire in the center of Paris. 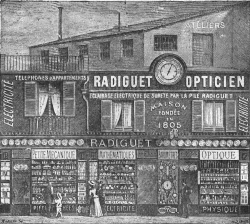 The storefront of Radiguet in Paris. 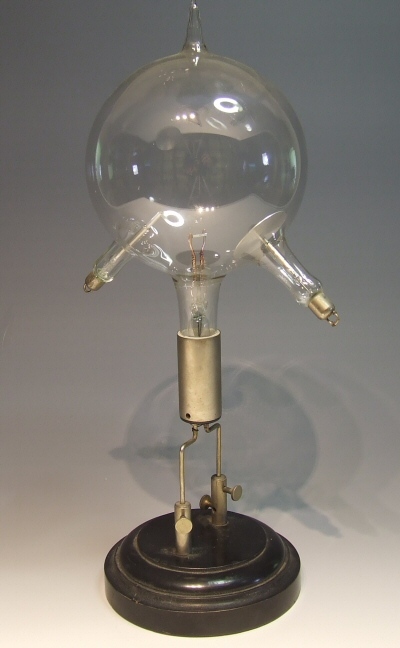 made by Müller Uri early 20th century. Activated arms of the tube. 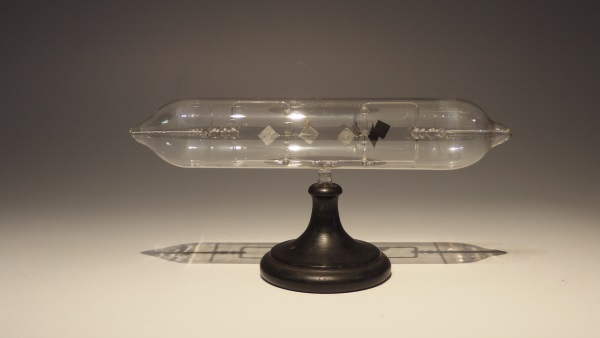 This tube sold by Kipp & Zonen ca 1920 was also used as a demonstration x-ray tube. 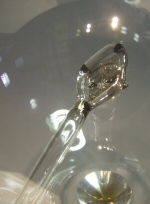 Probably produced by Emil Gundelach Germany. 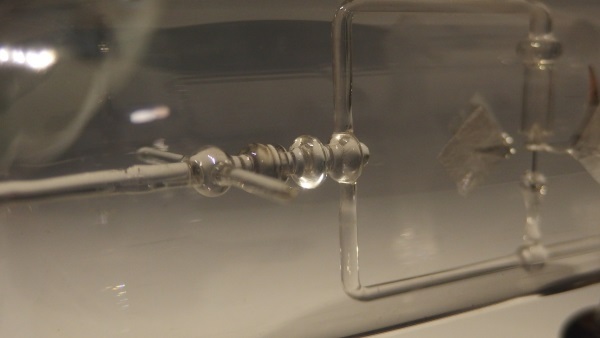 The axis of the foil foil has an angle of 45 degrees which was perfect for classroom X-ray demonstrations. 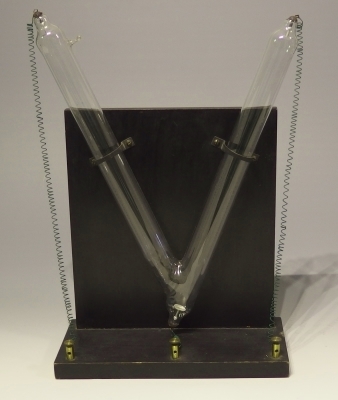 This rare tube was used for demonstrating the curving of the cathode ray by a magnet and as a substitute for the classic Thomson E/M tube with an Helmholtz coil. 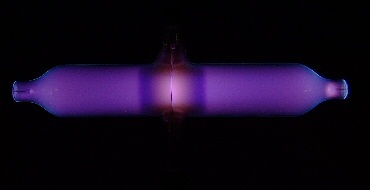 The oxide cathode produced a fine cathode ray beam. 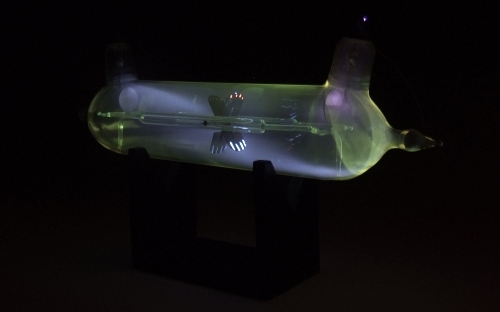 There are only six types of Wehnelt tubes known. Look here. 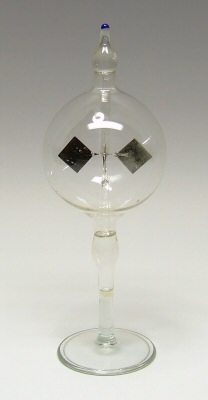 filaments developed by Wehnelt in 1904.
which was heated by a small voltage. 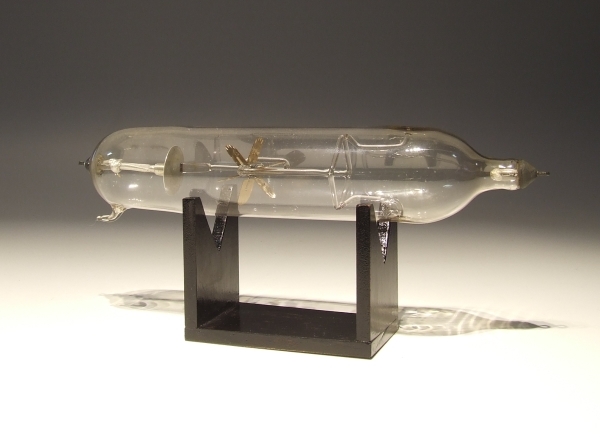 thousands like most Crookes tubes. 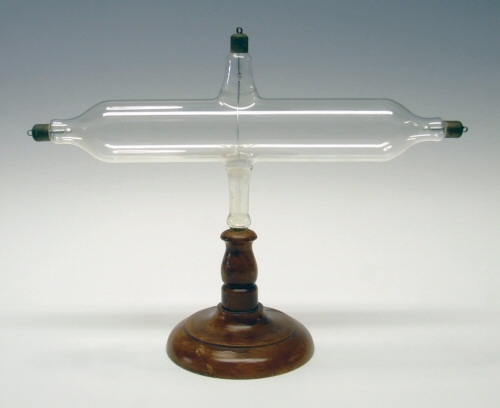 A piece of Crookes Radiometer History. 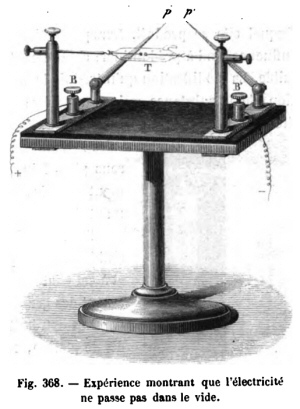 William Crookes (interested in spiritualism) did many experiments with the medium Daniel Douglas Home next to al his other physics work. 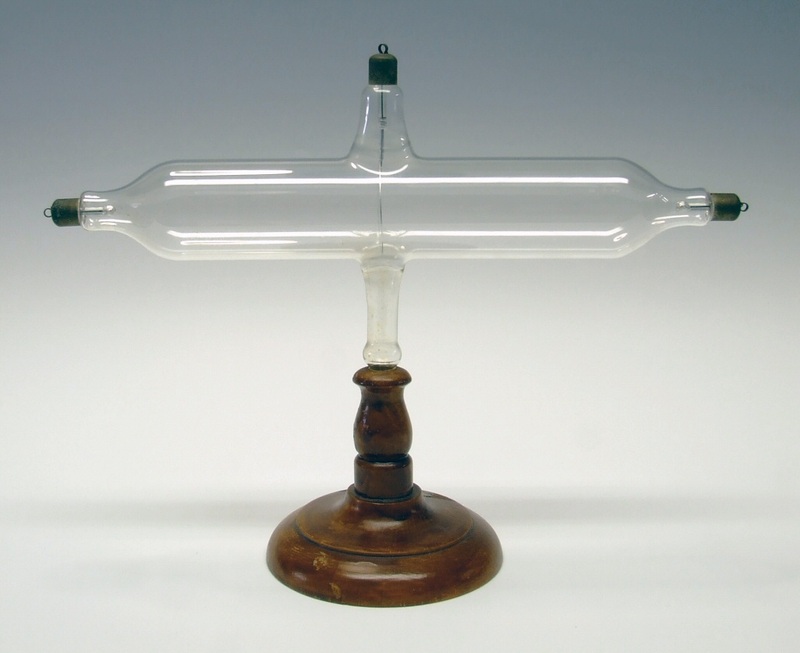 vacuum to eliminate the resistance of air molecules. 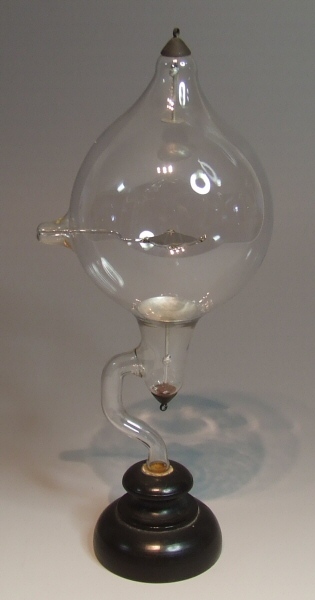 due to his self developed vacuum pump which irritated Crookes, his produced electrical radiometers glowed faintly due to residual gas. 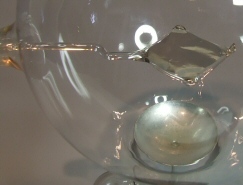 Source: Gasentladungsforschung im 19 Jahrhundert by Falk Müller. Look here and here for a great collection from the past. 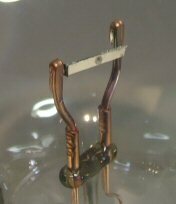 is no normal thermal airflow to rotate the vanes. 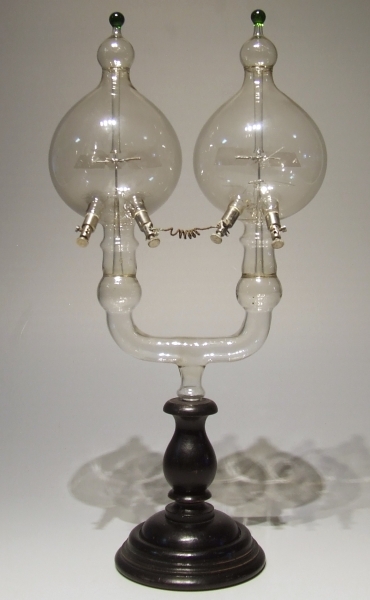 A very rare double radiometer ca 1880 French origin. This tube demonstrates the behavior of the difference between the blackened vanes and the clean ones. 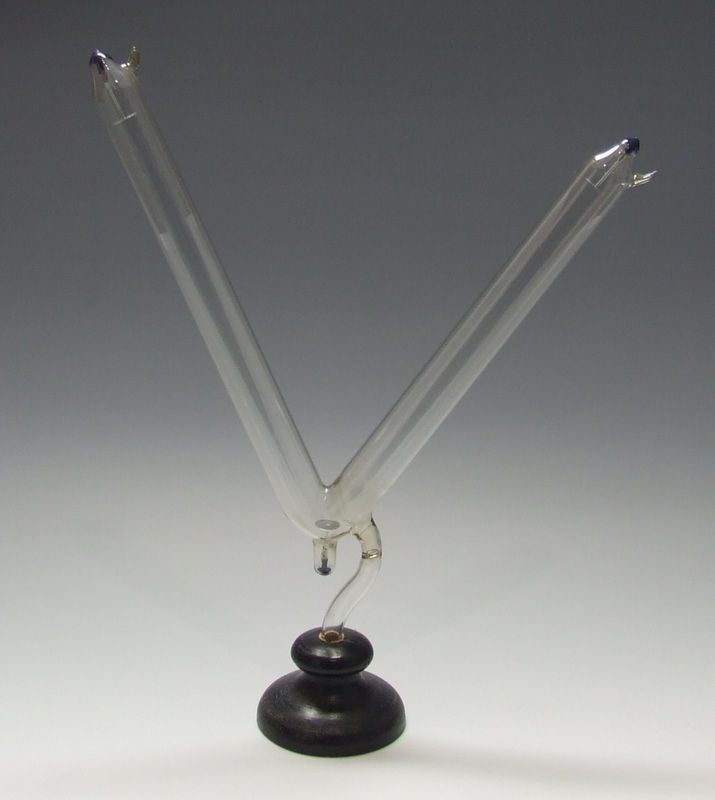 the blackened vane will turn when illuminated, the clear one not. 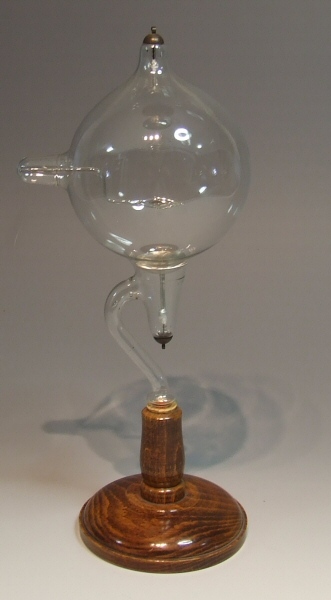 In Nature 1876 we can read that Alvergniat Freres build a tube to demonstrate the weakness of the blank vanes. 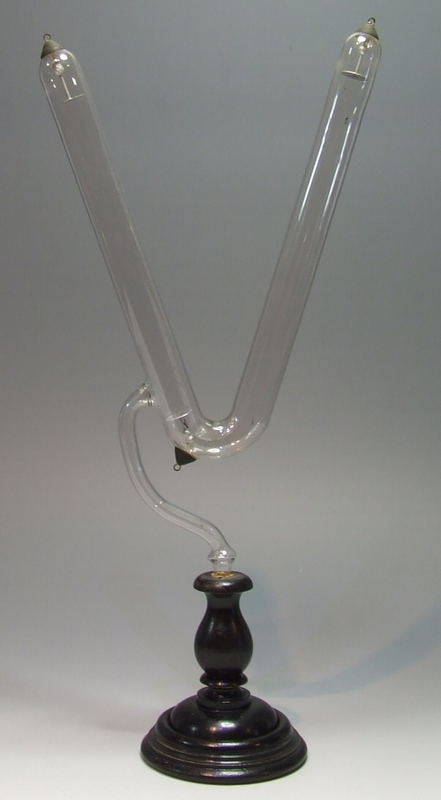 The glassblower craftsmanship is wonderful. 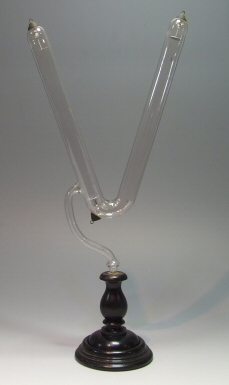 This tube has a potash regulator to regulate the vacuum. 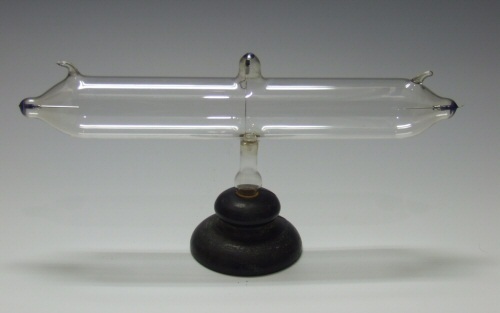 This regulator could be heated lowering the vacuum to show the change of the discharge in the tube.